LUXURY MOTOR YACHT ON TWO HULLS. 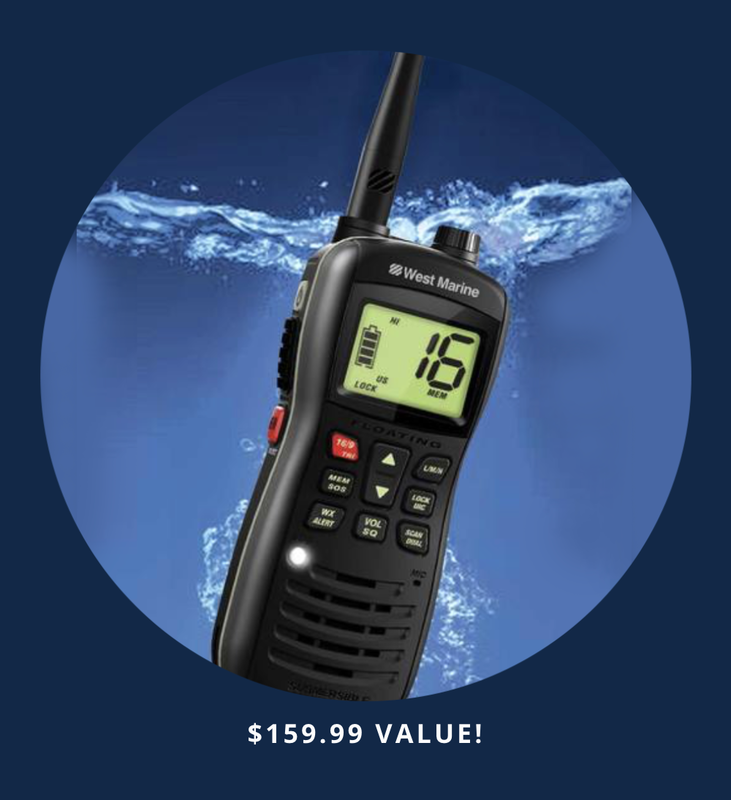 The concept and engineering phases have been completed, and now the development of the NAUTITECH 47 POWER is entering a new phase. 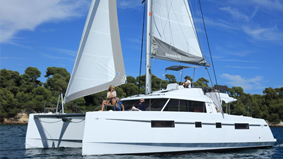 In BAVARIA CATAMARANS’ shipyard in Rochefort, France, construction is soon to begin on the catamaran, which is 14 metres long and travels at speeds of up 22 knots. 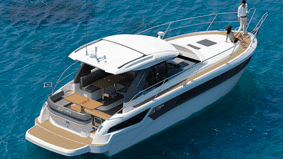 The NAUTITECH 47 POWER will be on display at trade fairs at the beginning of 2018. 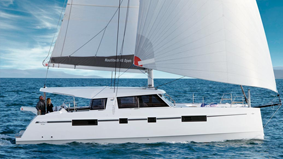 The clear lines and dynamic design of the NAUTITECH 47 POWER reveal the powerful elegance of this power catamaran. 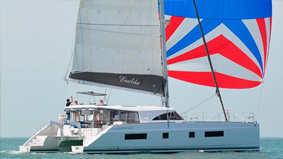 With a top speed of 22 knots, this catamaran doesn’t just have powerful acceleration, its cruising range of 1000 miles at a speed of nearly 9 knots is also testimony to its endurance. And whether on deck or below deck, there is plenty of room for luxury and relaxation. Sunsets on board the NAUTITECH 47 POWER are best enjoyed on the bow. That’s where one finds an enticing sofa and table with plenty of space for relaxing, not just in the evening. The stern of the NAUTITECH 47 POWER has multiple uses. 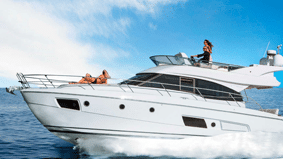 The lifting platform between the hulls can be used as a Tenderlift or as a bathing paradise. It easily lifts a Williams Minijet 280 out of the water. In its central position, it links the two hulls to form a flat space which becomes a wonderful area for sunbathing right next to the water. When the platform is completely lowered into the water, NAUTITECH 47 POWER has its own beach in shallow water. 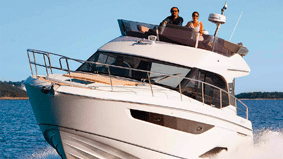 The day at sea is best spent on the generous flybridge. From here there’s a perfect view across the NAUTITECH 47 POWER as it gently swishes over the sea. 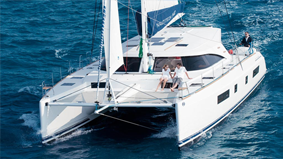 With a Bimini or a hardtop offering protection, the slipstream is there to be enjoyed and life can be lived to the full. 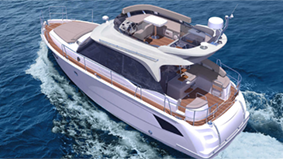 A barbecue and a wet bar are also at the ready on the flybridge. The big dinner with friends, or breakfast with the crew is best served on the long dining table in the large cockpit with direct access to the saloon. 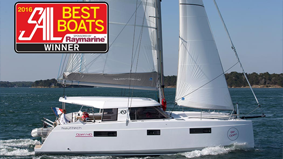 At BAVARIA CATAMARANS, we call this tried and tested room layout ‘open concept’. With this clever layout, cockpit and saloon melt into one living space. The perfectly equipped pantry, the exclusive lounge area in the saloon and the generous cockpit all give the impression of a penthouse apartment. 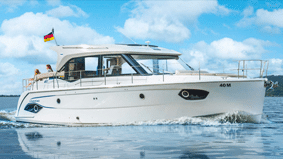 Driving pleasure is provided by two Volvo Penta D4 motors each with 225 hp or 300 hp. The balance of power and efficiency are particularly impressive. 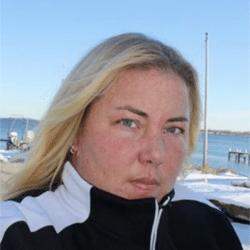 It can travel at a top speed of 22 knots, or cruise long stretches of 1000 miles without stopping. 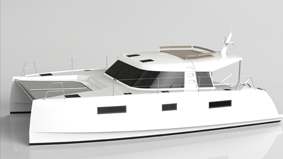 The NAUTITECH 47 POWER will be presented at trade fairs at the beginning of 2018 once the impending development and construction phases have been concluded.